This week was full of new learning adventures for me, including a start to my new community dietitian role at Food & Friends as well as leading my first ever cooking class! The six week session of the fall 2012 Cooking Matters classes started off with a focus on healthy cooking basics and the USDA's MyPlate. Participants were eager to learn new cooking techniques, try a variety of new foods and learn how to substitute healthy ingredients into recipes. ﻿﻿﻿﻿What was on the menu? A perfect well balanced meal for a rainy fall day…turkey chili with vegetables, confetti pepper cornbread, and northwest apple salad. Our volunteer chef, Carol Levin (who will be leading the cooking demonstrations for each of the 6 weeks) started this session off with a bang…the bang of knives hitting a cutting board and a rolling pin crushing roasted, bagged walnuts. Both are an example of some of the new kitchen techniques participants learned at this week’s Cooking Matters class. 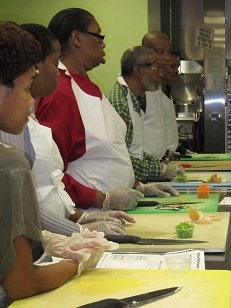 Each participant contributed to the different menu items by practicing their new-found knife skills cutting fresh garlic, apples, carrots and onions. In addition to the delicious aroma of chili filling the kitchen, there was excitement in learning about different ways each recipe could be modified to specific dietary needs or requests. Pauline, a client, learned how to use dried beans in place of the canned beans and other vegetables such as celery in place of the carrots in the turkey chili. ﻿﻿﻿﻿﻿﻿﻿﻿﻿﻿Participants enjoyed the meal they helped to prepare while learning more about food groups included in the meal. Dominique, our nutrition volunteer, reinforced the importance of a well-﻿balanced meal, portion control, and physical activity. The food label was introduced and participants determined which foods are high and low sources of fat, cholesterol and sodium. As this was my first experience leading Cooking Matters, I didn’t know what to expect. I was thrilled to see such a high interest level from all seven clients in learning more about nutrition and being involved in applying what they were learning to their current dietary habits. I’m excited to see where the next five weeks lead us as we learn more about each individual food group, try new recipes, and learn how to shop on a budget! Brittany is a registered dietitian and has been with Food & Friends since October 2012. Her previous experience was working as a clinical dietitian on the pediatric hematology and oncology unit at Children’s National Medical Center. Brittany completed her dietetic internship in Baltimore, Maryland through Sodexo-Mid Atlantic and is a graduate of Bluffton University in Ohio. She enjoys traveling, playing tennis and softball, making crafts, and has a new found love for leading cooking class. Learn more about Food & Friends' nutrition services.